This won’t be the first time you look for a Joomla real estate template, but it will be the last time. Because with OSP Home Search you have more than you could ever want or need. Whether you know it or not, many of the websites you visit are powered by directories. This won’t be the first time you look for a Joomla real estate template, but it will be the last time. Because with OSP Home Search you have more than you could ever want or need. OSP Home Search also supports RTL Language Layouts and specially it is designed to use with Joomal! OS Property extension. 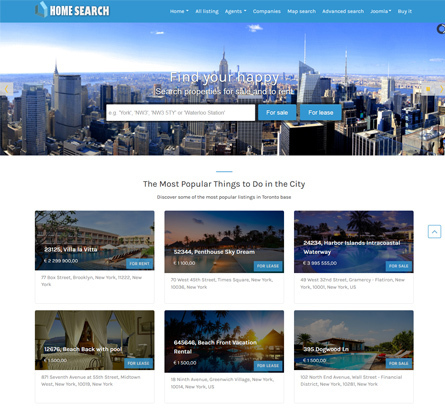 With no exception, OSP Home Search is fully responsive template at default, having all the great features T3 Framework has including ThemeMagic and Layout Configuration tool. Template comes in 6 color schemes and includes OS Property latest version. OSP Home Search is a versatile Responsive Joomla template for Real Estate Websites and supports both Joomla 3.x. It has nice & clean design and it comes loaded with tons of useful features like Advanced Google Map Search with property location markers. OSP Real homes also supports RTL Language Layouts and specially it is designed to use with OS Property extension. With no exception, OSP Real homes is built on the powerful T3 Framework making it a fully responsive Joomla template at default, having all the great features T3 Framework has including ThemeMagic and Layout Configuration tool. It's time for Real Estate planning, are you going to cooperate with us!? OS Property Real Estate is leading Real Estate/ Property listing JOOMLA extension. OS Property provides necessary flexibility and fully functional for creating real estate websites, property listing or rental websites with single or multiple agencies or real estate companies. T3 Framework and Bootstrap 3 is the success formula of OSP templates. Using ThemeMagic of T3, you can easily tweak the look of OSP Real Homes to your desire. All OSP Real Homes pages work well on all screen, from mobile to large desktop monitor. Now everyone is browsing with mobile devices, OSP Real Homes will give them first-class experience when visiting your real estate site. OSP Real Homes supports Right to Left language layout, like many other Ossolution templates. Among Joomla customized pages, OS Property is also equipped with multiple bonus pages Blogs, Feature Articles, Login, Registration ..etc and of-course all OS Property's layouts. OSP Real Homes was developed with extreme focus on typography and module styles and we believe it provides the most comprehensive content presentation capability. Headings, text, links, tables, images, everything was designed with high level of refinement. Your Hotel and travel site is not only Blue, but also Cyan, Orange, Pink, Green, and Red. OSP Home Search includes OSP Slideshow, OSP Map and OS Content Slider modules.